This may surprise you, but I already knew about the majority of the surf bands I’m reviewing before I started the Freaky Tiki Surf-ari. If I hadn’t heard of them on my own, then Strange Jason had recommended them to me. However, there are a few exceptions. While researching some albums on Amazon, I noticed a recommendation for Swingin’ at the Seance by the Moon-Rays. Intrigued, I clicked on the link and read up on the album. A CD composed entirely from re-recordings of vintage Halloween songs from the 20’s, 30’s and 40’s? It wasn’t eligible for the Surf-ari, but I decided to look up the band’s contact info and file it away for use in the next Halloween countdown. But in the process of doing so, I discovered that the band usually did surf music and my plans quickly changed. 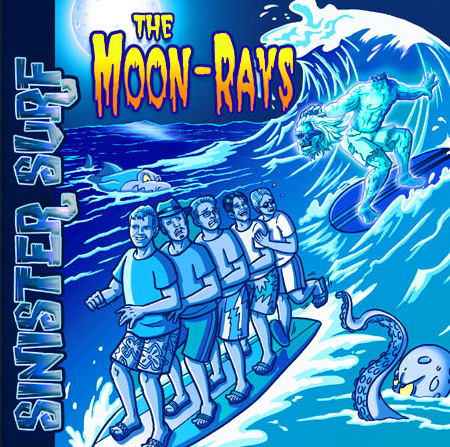 And that’s how the Moon-Rays became the second surf band I had discovered during the Freaky Tiki Surf-ari, the other being Witches in Bikinis. But enough about that, let’s talk about the band themselves. Formed in 2000, the Moon-Rays consist of Scott Mensching (percussion and vocals), Greg Griffiths (keyboards), Andy Blanco (saxophone and vocals), Brandon Cochran (guitar) and Paul Luka (bass). According to their Facebook page, the band’s first big break was in 2001. That’s the year they recorded the theme for the famous Creatures Features TV show. This foreshadowed the use of their music in many horror-related movies in the years to come (also noted on their Facebook page). Although much of their output in those days were cover versions of songs, Sinister Surf is one of their more recent ventures into albums consisting of mostly original material. But be it cover or original, the Moon-Rays always make it sound amazing. “Sinister Surf” gets things going with a mix of bongos and a surf guitar. The appropriately spooky undertones are greatly enhanced by the wailing saxophone. Said bongos and saxophone build up to a big finish, which then brings us to the next track. Put on your beret and sunglasses daddy-o, ’cause “Spookwalk” has a very beatnik sound and feel to it (especially in its use of drums, cymbals and saxophone). Said instruments take center stage over the guitar and organ-sounding keyboard. The guitar later takes over and adds to the song’s definite feel of strutting down street, but the sax returns as focus for the ending. “Drag Fink” is clearly inspired by Rat Fink, which is appropriate since the album is dedicated to Ed “Big Daddy” Roth. Bongos and soft guitars build things up, and cymbals join in with the occasional saxophone toot which grows into a riff of sorts. The guitar takes the reins until the sax takes over and gets assistance from some light bongo use as it fades out. “Hare-um Scare-um” has a rather spooky organ (keyboard) opening. A guitar then starts in, with the “organ” merely providing backup. The finger cymbal clashes sprinkled throughout add a Middle Eastern feel. Drums pop in, along with a saxophone, then the organ gets more prominent role. Drum beats and guitar strums take us to the end. Although I doubt the song was intended as a reference to the fact I’m about to share, I still find it interesting that the Elvis movie Harum Scarum played on a double bill with Ghidrah, the Three-Headed Monster in some US markets. “Hearse With a Curse” warns that there isn’t anything worse than the item mentioned in the song’s title and we’re warned not to buy it several times throughout the song. Creepy sound effects give way to a sax, drums, guitars and “organ.” The guitar use takes over for the organ by the time the humorously sung warning reappears. There’s also a skit of sort as some poor sap named Billy (Mensching) expresses interest in the cursed hearse, which the evil, laughing salesman (Blanco) takes full advantage of. As Billy drives off, the guitars wind down and we hear a hubcap rolling that suggests an accident has taken place. The liner notes say this was not written by The Moon-Rays and I can only guess that the group guest appearing on this track (The Dead Beats – Kathy Dunjai, Bill Holtane and Robert Lewis) originally composed it. “The Devil In Nylons” uses a sax backed by drums and cymbals to conjure up the image of a dangerous, sultry figure. It can sound extra “surfy” at times, especially the “Wipe Out”-like part. The guitar strums and possible light vibraphone use give “Mysterion” an eerie feel to its opening. This mood is further enhanced by aided by sound effects. A guitar and the organ-sounding keyboard sets an assertive pace (but with hint of mystery as well). Drums pop in and out, as does a heavier-sounding guitar. Our old friend the sax jazzes things up while vibes, guitars and more sound effects bring things to a close. “Night of the Rodent” has a classic surf buildup, with a shaking tambourine and saxophone wailing like banshee coming in soon after. Guitars and soft, wordless female vocals (by guest singer Joelle Charbonneau-Blanco) remain in the background for much of song, but do rise up on occasion (especially for the end). “The Raven (for Beatniks)” has a “beatnik exotica” feel due to its vibraphone (played by guest musician Bruce Nelson) and drum-based opening, which is soon followed by the saxophone. Said vibes often underscore points and the sax gets long interludes in between the beatnik-ized lyrics before the song’s abrupt stop. One Maynard G. Krebbs is responsible for this unusual (but amusing) reworking of Poe’s classic and beatnik lingo guide in liner notes will come in quite handy for any confused listeners. “Deep Into Midnight” starts with clashing cymbals and chimes, which lead into light guitar and piano (handled by Scott Mensching) work. The overall mood is very soft and relaxing, especially the saxophone use and female “la la la’s” and “oooohs. ” Magical sounding chimes pipe in at times and are used to great effect for the conclusion. “Sophomore Werewolf In Love” is a bonus a capella-slash-doo-wop track, complete with finger snaps and a howling “a-wooo” chorus. It’s dead-on parody of the old “lovesick teenager” song, with the twist that the protagonist is also a werewolf. There are plenty of humorous asides, such as the lead singer commenting on the close proximity of a haunted forest to a high school and his being equally afraid of angry villagers and being grounded. His wondering about why this sort of thing happened to a good kid like himself will undoubtedly remind horror fans of the poem from The Wolf Man. “Night of the Day of the Dead” is a hidden bonus track whose existence is hinted it on the back cover. It’s a Mexican-sounding surf song with excellent guitar work backed by drums and maracas. It gets somewhat heavier towards middle, but softens up just before fadeout. It’s easily one of my favorites from the CD. Speaking of the CD, its designed to look like a vinyl LP. However, the grooves are printed on rather than actually being grooved like Strange But Surf’s Swimming in Reverb was. In any case, you should definitely pick this up. I think you’ll enjoy discovering this album as much as I did. Special thanks to Sound Imp Records for the review copy!